Celebrate your summer party the right way with the Dual Lane Kahuna from Inflate-A-Party! Perfect for anyone ages 2 to 50! Features dual slides for maximum fun. Enjoy fun characters and bright colors. Looking for a great way to spice up your summer event? 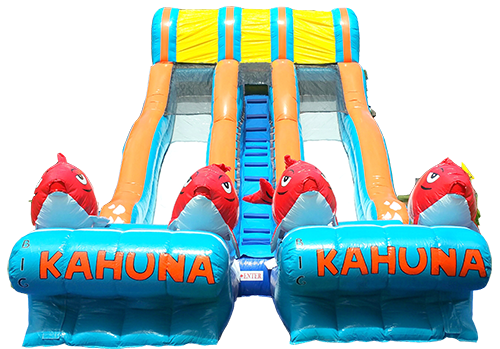 At Inflate-A-Party, we have a wide selection of bounce houses, inflatables, and water slides, including the Dual Lane Kahuna! This water slide is sure to be the hit of the party, whether you’re hosting a kids’ birthday party, church event, school fundraiser, or you simply want to have a great time. This water slide will ensure that everyone at your party has a fantastic time. Check out all of our water slide inflatables, including the Dual Lane Kahuna today!